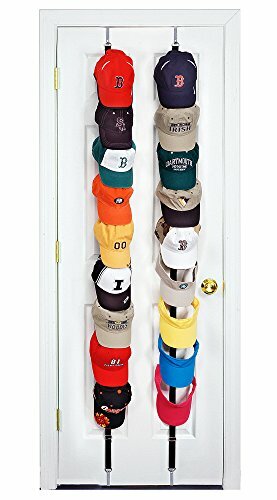 The Perfect Curve CapRack18 is perfect for storing, displaying and organizing up to 18 baseball caps and visors. With two separate cords, each able to hold 9 caps/visors, you have the flexibility of putting both cords behind one door, or using a cord behind different doors in different rooms. Each cord has its own over-the-door and under-the-door hooks as well as a metal adjustment buckle to ensure a snug fit behind a door. If you have any questions about this product by Perfect Curve, contact us by completing and submitting the form below. If you are looking for a specif part number, please include it with your message.